When the Twins declined their $3.6 million option on Jared Burton for 2015 it seemed like the first step toward a possible bullpen overhaul designed to usher in some younger, harder-throwing arms to surround closer Glen Perkins. Instead they tendered arbitration eligible Brian Duensing a contract for a projected $2.5 million, keeping the low-upside lefty around for another year, and now they've signed 33-year-old right-hander Tim Stauffer to a one-year, $2.2 million contract. Stauffer was the fourth overall pick in the 2003 draft that saw the Rays select Delmon Young in the top spot and was viewed as a potential top-of-the-rotation starter coming out of college. He moved quickly through the Padres' farm system, debuting in 2004 at high Single-A before moving up to Double-A after just six starts and then spending the second half at Triple-A as a 22-year-old. Overall he posted a 2.89 ERA in 28 starts, but it came with just 113 strikeouts in 168 innings. Stauffer stayed at Triple-A to begin the 2005 season and was called up to San Diego for his MLB debut on May 11, tossing six innings of two-run ball to beat the Reds three weeks before his 23rd birthday. He stayed in the Padres' rotation until a pair of poor starts in late July led to a demotion back to Triple-A. Stauffer finished the season with a 5.33 ERA in 81 innings for the Padres and a 5.14 ERA in 75 innings at Triple-A. He spent most of the next two seasons at Triple-A, making just three total appearances for the Padres, and then missed all of 2008 and part of 2009 following shoulder surgery. 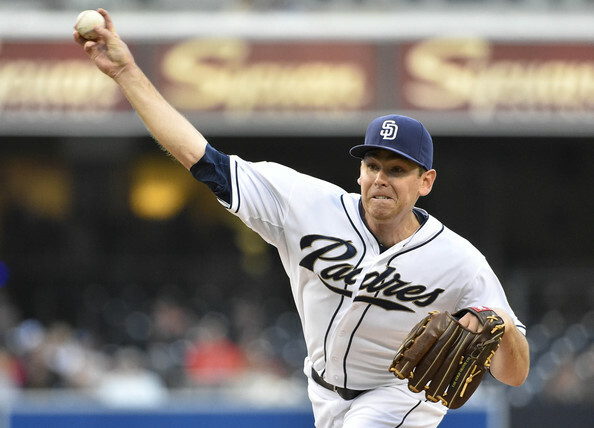 He worked his way back to the big leagues and pitched well for the next three seasons, establishing himself as a full-time member of the Padres' rotation ... and then he missed nearly all of 2012 following elbow surgery. This time when Stauffer returned from injury it was as a reliever. Serving a low-leverage, multi-inning bullpen role similar to the one Anthony Swarzak filled for the Twins before being non-tendered this month, Stauffer made three mostly poor starts and 84 mostly good relief appearances for the Padres between 2013 and 2014. As a reliever during that two-season span Stauffer threw 126 innings with a 3.21 ERA and 121/39 K/BB ratio, holding opponents to a .242 batting average and 10 homers. Nice-looking numbers, but less impressive when placed within the context of where he pitched. And that's really the story of Stauffer's whole career as a major leaguer. He's called MLB's most pitcher-friendly locale, Petco Park, home for his entire seven-season career and not surprisingly Stauffer has a lifetime 3.07 ERA at home compared to a 4.64 ERA on the road. His road ERA was 4.28 in 2013-2014, during which time the average NL reliever posted a 3.51 ERA. If you look only at Stauffer's raw totals you may see a logical replacement for Burton as Perkins' primary setup man, but adjusting for context shows him as more of a mediocre middle reliever. Which is fine, of course. Signing a mediocre veteran middle reliever for $2.2 million is reasonable, but the Twins have plenty of young arms to potentially fill that role for a fraction of the cost and with much more upside than a 33-year-old with a lengthy injury history and a 91-mph fastball. Stauffer joins Perkins, Duensing, and Casey Fien as locked into the bullpen, with Caleb Thielbar likely to have a spot as well. That leaves two spots up for grabs, one of which may go to the loser of the Tommy Milone vs. Mike Pelfrey fifth-starter battle. Rule 5 pick J.R. Graham has to stay in the majors all year or be offered back, Michael Tonkin, Ryan Pressly, and Lester Oliveros deserve chances, and Alex Meyer and Trevor May may need somewhere to get their feet wet. Exactly the sort of move I expect from a franchise that signs Torii Hunter for way too much money.